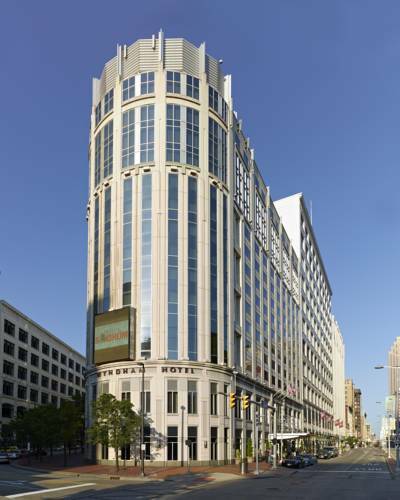 Located in the vibrant theatre district, right on glittering Playhouse Square, the Crowne Plaza at Playhouse Square hotel will leave guests cheering. The rooms and suites at our downtown Cleveland hotel, provide everything both leisure and business travelers desire. The intimate lobby and professional staff are always ready to help make this boutique-style hotel a great place to wind down after a night on the town. Just a few blocks from the Crowne Plaza Cleveland at Playhouse Square hotel you can catch the latest shows at Playhouse Square, get in tune with your favorite music at the Rock and Roll Hall of Fame & Museum and explore the Great Lakes Science Center. If sports are more your hobby, you can catch a Cleveland Cavaliers home game at the Quicken Loans Arena or visit Progressive Field, home of the Cleveland Indians professional baseball team or watch a Cleveland Browns Football game at First Energy Stadium. Businesses near hotel: Sherwin Williams, Dealer Tire, Applied Industrial Technologies, Cleveland Clinic Foundation, University Hospital, Case Western Reserve University, General Electric. Start your day with breakfast buffet located at the Ghost Light Restaurant & Lounge and relax at the hotels newly remodeled indoor heated swimming pool, hot tub and sauna. End your day at the award winning Happy Hour at the Hotels Ghost Light Restaurant & Lounge. Bright, modern spot serving a long menu of elevated Mexican fair paired with tequila and cocktails. The Palace Ballroom is our largest meeting room offering 5,100 square feet of space with 15' ceilings overlooking Playhouse Square Theater District and the Worlds Largest Chandelier. Perfect location for any event. Located on the 2nd floor with brand new pre-function space carpeting, vinyl and window treatments. Overlooking the worlds largest chandelier, perfect location for your next event. Stillman Meeting room situated on the 2nd floor, offering natural lighting and flexible space for a variety of layout options. Situated on the 3rd floor; elegant space, perfect for evening reception or breakout room. Situated on the 3rd floor, perfect location for banquet, reception, meeting or breakout session. Overlooking Playhouse Square and the worlds largest chandelier. Spacious event space and flexible to accommodate several layout styles with natural lighting. Located in the Gateway district, Progressive Field is home to the American League Champion Cleveland Indians. Grab a bite to eat in the new Right Field District and cheer your team to a victory. A must-see for any music lover on the shores of Lake Erie, this supremely modern structure is dedicated to the history of the best-known and most influential artists, producers and others in the music business. Exhibits focus on helping everyone to understand science, technology, and their interdependence with the environment. Besides fun permanent and traveling exhibits, it features an Omnimax theater. One of the top hospitals in the nation, its physicians represent 120 medical specialties and subspecialties. The clinic was ranked number one in America for cardiac care for 22 consecutive years. The fourth largest of the Great Lakes, it's a wonderful place for boating, fishing or just enjoying some tranquility. < 1 mile from Cleveland.